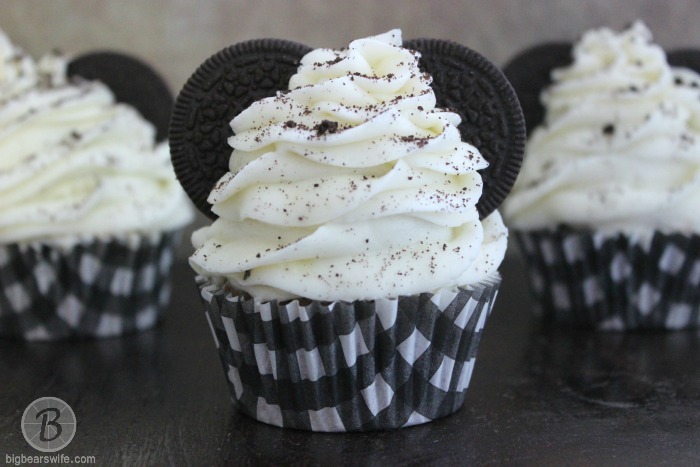 We found these cute Mickey Mouse Oreo Cupcakes at Disney’s Pop Century Resort and had to remake them once we got home! 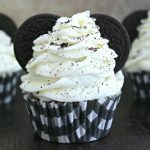 These are my Pop Century Copycat Mickey Mouse Oreo Cupcakes! Wow! Now that was a crazy but great weekend! 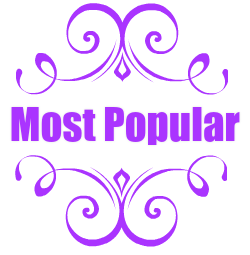 Or maybe I should say that it was crazy busy!! 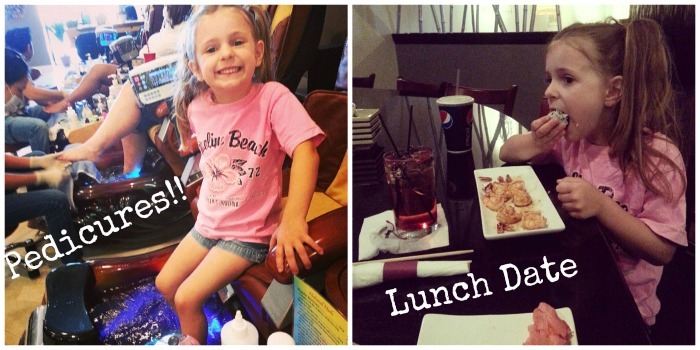 I took last Friday off from the office job and used it as a “blog day”. 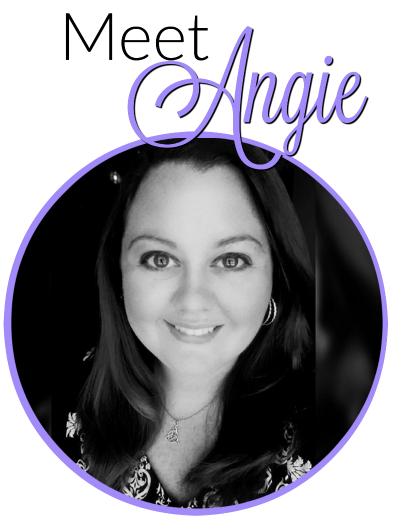 I would love to work full-time as a blogger, but until that day comes (if it ever comes) I’m going to try to take off once a month to get some things done on the blog. YAY for being able to do that! Thursday we had a bad storm here and it knocked out a lot of power around us. My friend Nikki and her girls came over and stayed the night because they didn’t have power and a dark, hot, sticky house is no place for little ones. (Well not really a great place for anyone). 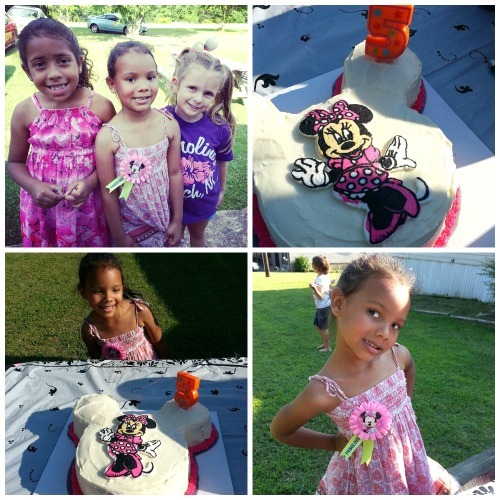 I worked on the Minnie Mouse butter cream transfer for Kendra’s Minnie Mouse cake and just hung out with the girls. That Friday morning I watched Nikki’s girls so that she could do some last minute birthday shopping and baked the Minnie Mouse cake, I spent the rest of the day making cupcakes, decorating a cake and working on blog stuff. Well, that’s until my niece got there. haha She’s 4, she’s a ball of energy and she LOVES her Angie and Uncle Thomas. I actually got the spend the whole weekend with her. Saturday morning Savannah and I went to the Farmer’s Market and even got pedicures. After a quick lunch of shrimp and sushi we headed back to the house so that I could finish Kendra’s Minnie Mouse cake and get ready for the birthday party. 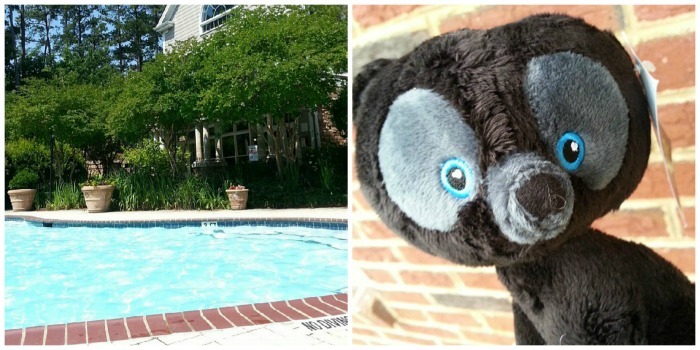 I drove back home to VA for a cookout for Father’s Day on Sunday evening, watched True Blood (YAY it’s back on!!) and then crashed haha I need a weekend to recover from the weekend! 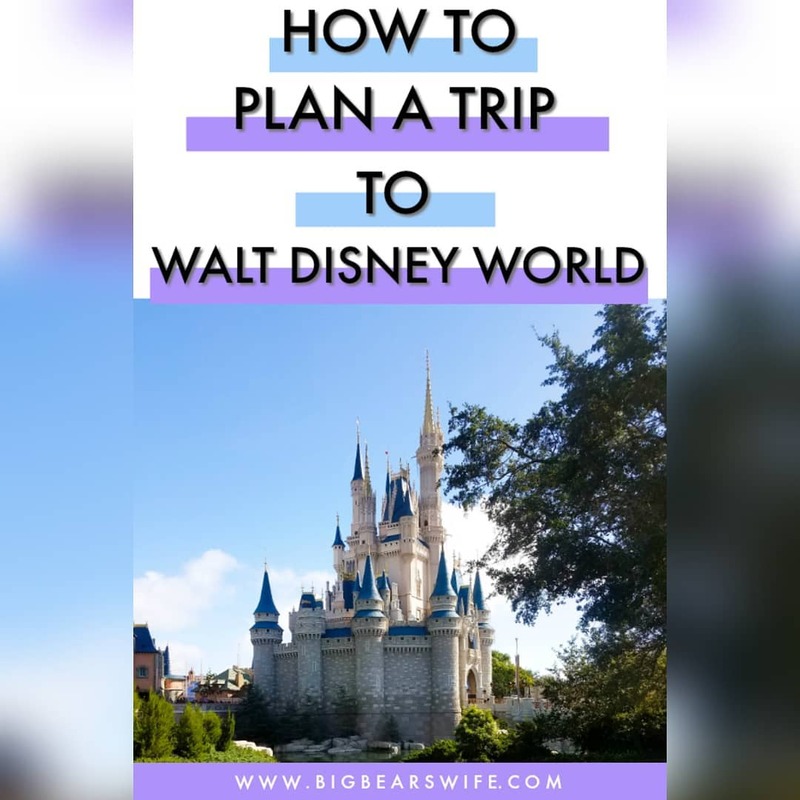 When we were at Disney in May, we stayed at the Pop resort for our last night and even though I was exhausted beyond belief, I managed to drag myself from our room to the restaurant for dinner. Restaurant… ok more like a food court, but at this point I didn’t care. However over in one of the fridge cases, I noticed some cupcakes. Those put a little bounce in my step and I jetted over to see what kinds they had. 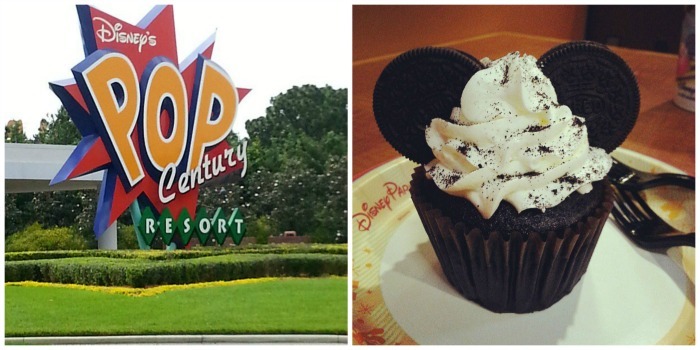 I had seen a POP cupcake online before going down there and had my hopes set on getting one of those, but when I got there they only had Oreo Mickey Mouse cupcakes. Well, even though it wasn’t exactly what I was looking for, it was a Mickey Mouse cupcake and BigBear loves Oreos, so it worked. Once I got home I knew that I had to re-create them! 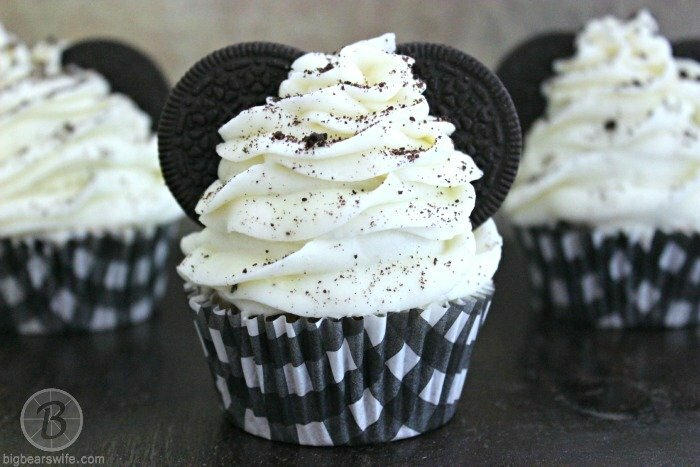 Mickey Mouse and Minnie have been everywhere thanks to Kendra’s birthday party haha, so I knew this would be the perfect time to make these Mickey Mouse Oreo Cupcakes at home. First, let’s go over a few things about these cupcakes. The cupcakes at Disney are HUGE. I do have a huge cupcake tin but was out of huge cupcake liners so I just made regular sized cupcakes (which is why mickey’s ears look enormous haha). I actually broke the oreos in half for my ears because the whole Oreo was way too much. Second tip, don’t mix oreo crumbs into your frosting if you’re going to be piping the icing onto the cupcake. Unless you are 100%… no make that 10000% positive that all of the crumbs are super fine. They’ll clog your pipping tip. It was better for me to frost them and then sprinkle oreo crumbs over the cupcakes. I don’t see anything wrong with using boxed cake mix but I do prefer homemade icing because I can make a ton for less than the price of buying it. So if you want to use boxed cake mix (I do a semi-homemade cake recipe) and canned frosting, then go for it. 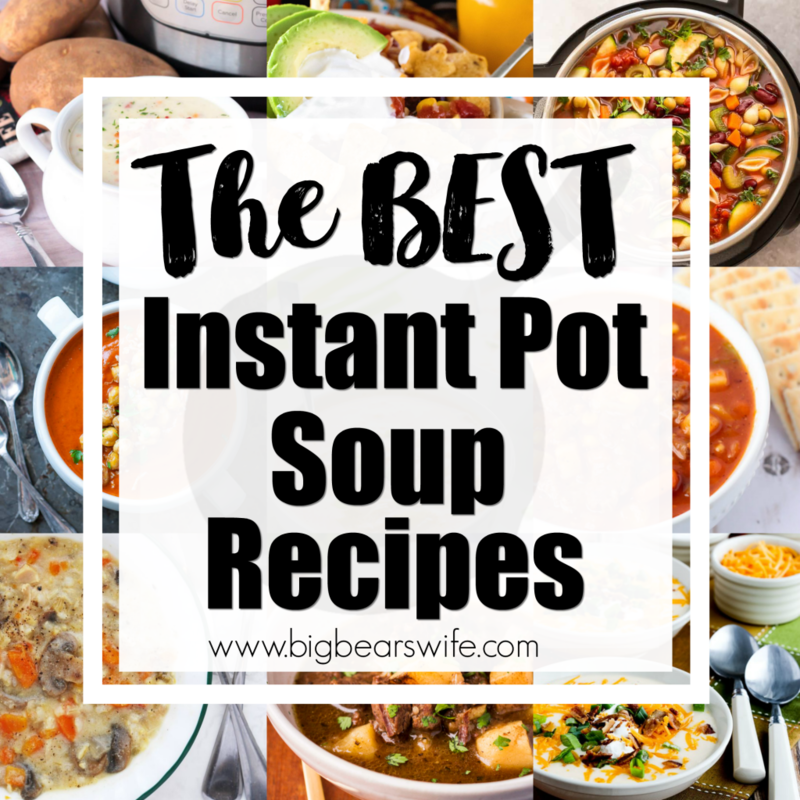 If you want to make everything from scratch, have at it. Do whatever works for you. I added the creams of some of the oreos to my icing, but you don’t have to do that. 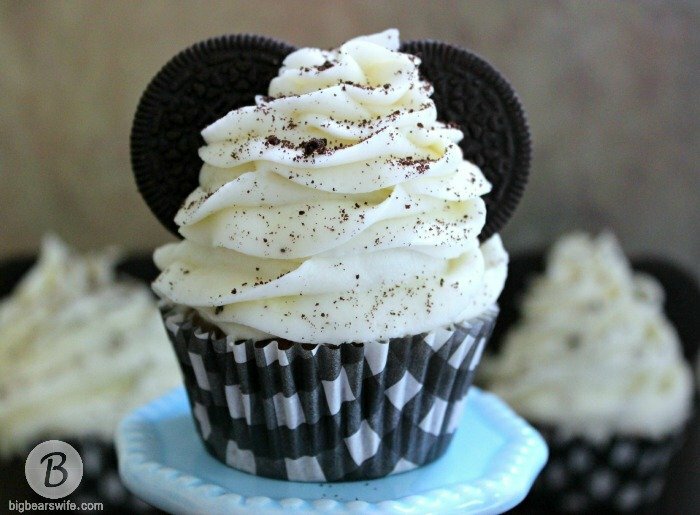 These Mickey Mouse Oreo Cupcakes are so super easy to make and pretty cute in my opinion. 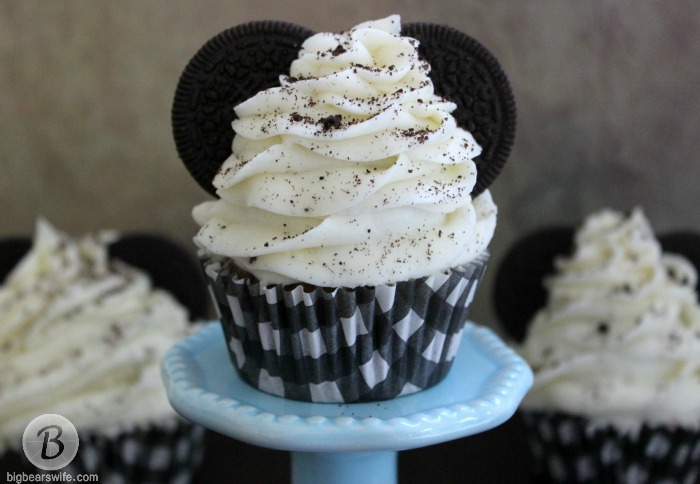 We found these cute Mickey Mouse Oreo Cupcakes at Disney's Pop Century Resort and had to remake them once we got home! 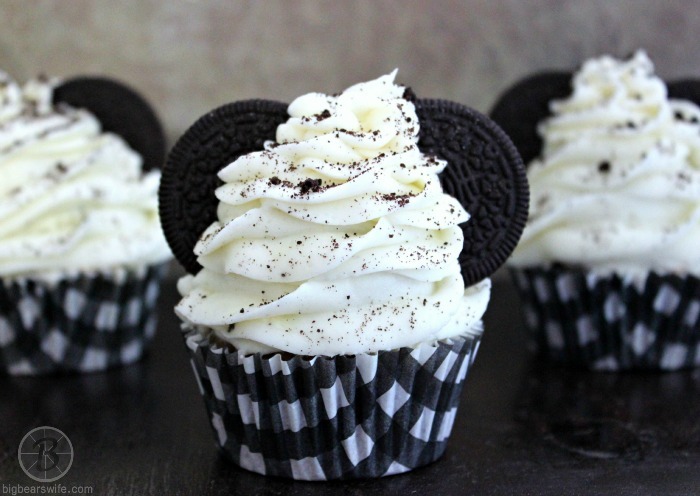 These are my Pop Century Copycat Mickey Mouse Oreo Cupcakes! 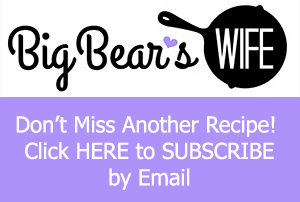 In a large bowl, mix together cake mix, flour, sugar, and salt. In the bowl of a mixer, mix together the egg whites, water, and vanilla. Mix on low for about 10 seconds. Slowly add the dry mix a little at a time. Mixing on low until everything is combined. Line a muffin/cupcake tin with paper liners. Fill each cupcake liner 3/4 full of batter. Bake for 25 minutes. Remove from oven and cool. Once cooled, use a small spoon or knife to remove from of the center of the cupcake. Set aside. Cream butter in the bowl of a mixer. Add cream cheese and mix well. Slowly add powdered sugar while mixing. Add in oreo creams. Mix well. Add vanilla and heavy cream. Mix until combined. Add a few tablespoons of icing to the bowl of cupcake centers. Mix together until a dough forms. Roll dough into 2 inch balls and place one on top of each cooled cupcake. Sprinkle oreo crumbs over the cupcakes. 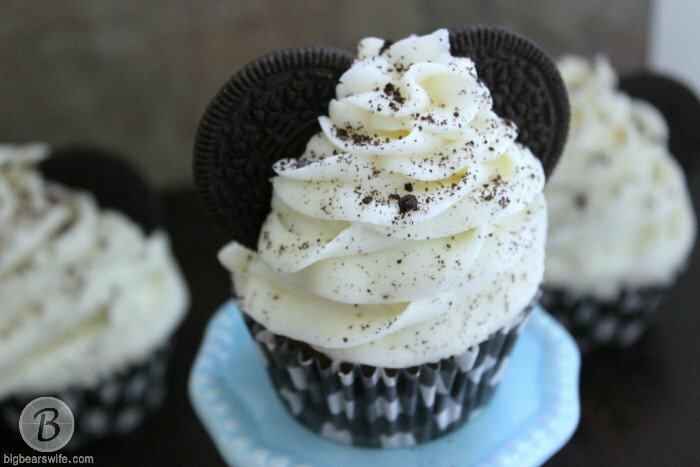 Add oreos for Mickey ears. These are so dang cute. What kid or adult wouldn’t smile at a plateful of these! 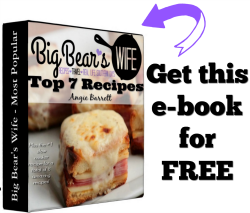 Sometimes I don’t know where you find the time to bake, let alone post about it all. Great looking cupcakes and a sweet post. Cute cupcakes!! Love the idea of the cake ball to add to the height. I’ll have to try that some time. I love the look of such tall cupcakes but I don’t like a ton of frosting! These are so cute and you did have a crazy weekend! You need all week to recuperate from that. I hear ya, wouldn’t blogging full time be amazing. Instead we are both still punching the regular old job …. boooo! So cute and yummy! Love it! These are so precious! Love them! Squee, these are adorbs. I can’t even stand it. Love, love, love!